Magic Dinner Show at WonderWorks in Orlando Florida. Discount Coupons and Discount Attraction Tickets are available to the Outta Control Magic Show.. This hidden gem is widely known as the funniest and most entertaining dinner show in Central Florida! Everyone likes illusions and magic, and here at the Outta Control Dinner and Magic Show you can find them both! We can assure you that by the end of this show you will be gasping for air as you laugh away the night with your hilarious host! Be amazed by incredible tricks that cannot be explained! Tricks like filling up a crushed soda can till it’s so full it expands, then letting an audience member drink it! From card tricks to vanishing acts you will see it all here at the Outta Control dinner Show! Because it is a dinner show food is served the entire time you are there! Since it is a magic show the food carries a certain move theatre kind of theme, with pizza, pasta, salad and pop-corn served the entire time! All you can eat pizza and pasta while enjoying this funny and jaw dropping show! The best part about this great show is the audience involvement, throughout the show you will find audience members on the stage participating in these incredible tricks! Bring friends and family for a good laugh and get them on stage in these comical acts! 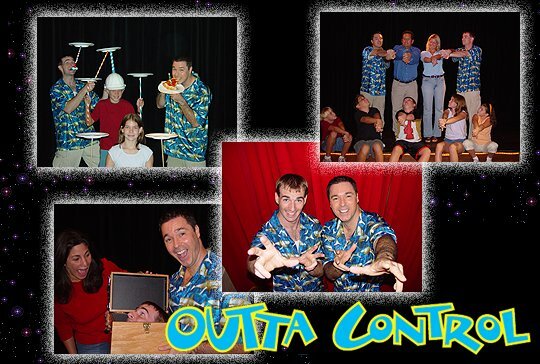 The Outta Control Magic Show provides a one-of-a-kind entertainment experience to the Orlando area with non-stop audience participation. Shows are presented nightly at 6:00pm and 8:00pm. 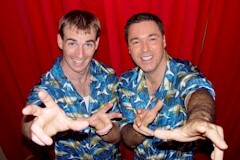 This hilarious show combines high-energy comedy improvisation with spectacular magic to thoroughly entertain audiences of all ages. During the show, enjoy unlimited fresh hand-tossed pizza, popcorn and unlimited beer, wine and soda. The 90-minute experience will keep you on the edge of your seat and tickle your funny bone every 8 seconds. The production features nationally recognized actors Tony Brent and Danny Devaney who are sure to keep you busting at the seams.